Helping to Lead the Flock. Dr. Outlaw has been an Elder in the North Georgia Conference, serving churches in the Conference since 1990. Though born in Hartsville, South Carolina, Dr. Outlaw attended primary and secondary schools in north Georgia. He split his college time between North Georgia College in Dahlonega and Georgia State University, where he received a BBA degree in Finance in 1981. After working in business in the '80s, Dr. Outlaw answered the call to preach and started his ministry at Red Oak UMC in College Park in March of 1990. He received his Master of Divinity degree in 1993 and Doctorate in 2002. Dr. Outlaw and Lynn married in 1983. They have two grown, married children, Lindsey and Mark, Jr., three grandsons, and two granddaughters. In addition to church life and ministry, Mark and Lynn enjoy family time, travel, and lake activities on Lake Lanier. Joy was born and raised here in Lathemtown. Her love for music came mostly from her father, Ralph Gaither. He sang beautifully and also played the piano and was the music leader here at Orange UMC for many years. She was surrounded by many other wonderful musicians here at Orange throughout her life. From talented pianists, organists, and instrumentalists, to fabulous vocalist—the influence on her was, in her words, life-changing! No wonder music became so important to her! Joy has led the Adult Choir since she was a young adult. She also leads the Kids Choir and Hand Chimes Group. Quote: "It is such a blessing to me. I feel like music is an important part of our ministry here at Orange UMC. I pray that it touches the lives of everyone in our Church and throughout the community." Bethany also grew up in Lathemtown. She is the daughter of our choir director, Joy, and has attended Orange UMC all of her life. She has fond memories of participating in VBS, Sunday School, Kids Choir, and other children’s programs at OUMC. Her goal is to provide great opportunities for fun and learning to the current children of Orange. She is a member of our Adult Choir as well as singing in our smaller ensembles. Her husband, Brandon, operates the sound system at church and helps out with all the kids programs. They have one daughter, Camille, who loves spending time with the other children at church, and a cute doggie named Foxy. During her free time, Bethany enjoys spending time at Lake Lanier, singing, and hanging out with her family and friends. Please feel free to contact her if you have any questions about our Kids programs. education, most recently from Macedonia Elementary, but will never retire from working with children/youth and serving in many capacities in her church. Working with the kids from BLAST is one of the greatest blessings she’s ever experienced in working with children! Lynn and Mark have been married for almost 35 years and have a daughter Lindsey (married to Greg) and son Mark, Jr (married to Randi) and the most precious grandchildren, Wesley, James, Gracie, Jude, and Abigail. Besides being busy as YaYa to her grandchildren, Lynn enjoys traveling, reading, and spending time on the lake. 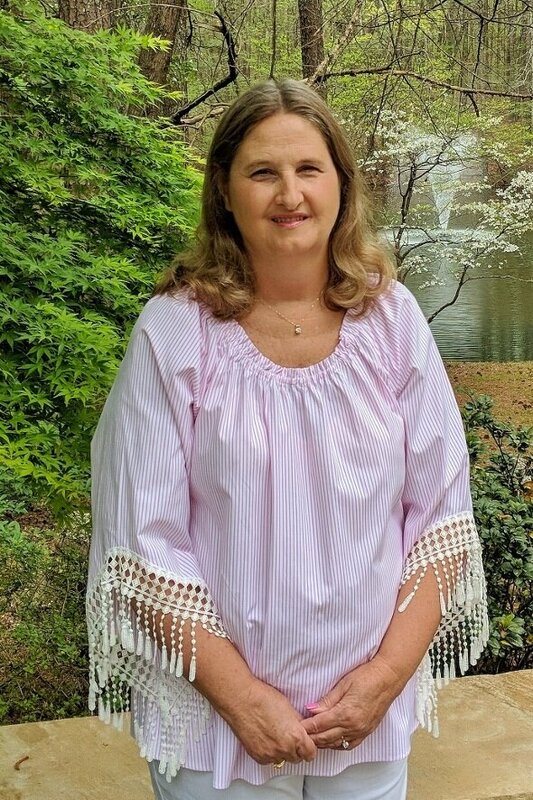 Any time you have business at the church office, need to call for information, or are in the neighborhood and want to stop to say “hello”, chances are very good that you will be greeted by the smiling face of Sharon, the administrative assistant for OUMC. Sharon has lived close to Orange UMC for twenty years. She has called Macedonia and Hickory Flat home, and has finally settled in Ball Ground. She grew up in Misowa, Japan and Stuttgart, Germany where her parents were DoDDS teachers. She moved to Columbus, Ohio to attend Capital University graduating with a Business Administration degree. Tom is her husband and they have three beautiful daughters, a granddaughter, and a cat. She loves to read, run, and laugh. Sharon is also currently serving as our Financial Secretary. Patrick grew up in the Methodist Church with his family in Marietta. He graduated high school from Mount Paran Christian School in 2015 and is currently a student at Kennesaw State University where he is majoring in sports management. After graduation, he plans to open up a Christ based gym while continuing to work in youth ministries. (770) 886-9662 or visit the contact page.